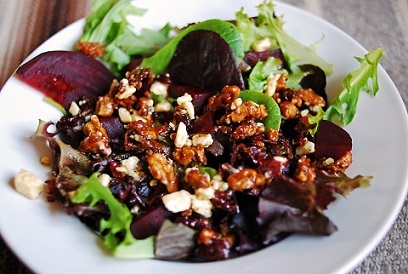 This Sugared Walnut Recipe is excellent to use for enhancing salads. They can also be used on an appetizer tray or eaten as a snack. So a word to the wise ...keep them out of children's reach. I have to hide them from my husband! He's one of my kids! You can purchase these if you wish or if you run short of time, but this restaurant recipe results in a very tasty treat and it is an easy recipe for salads or as an appetizer. Preparation time: 10-12 minutes. Makes 1 pound. Cool on sheet pan stirring once or twice. Do not touch while hot! When cool, put in an air-tight container and store until you want to serve them with one of the delicious restaurant salad recipes like the pear salad. Don't forget that these can be a star enhancement on an appetizer tray, even a cheese appetizer tray. If you wish to read about how I set up a cheese appetizer tray, click here. 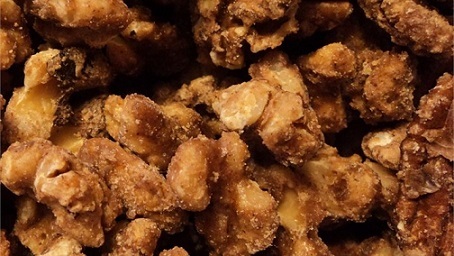 Just add the walnuts to the tray. 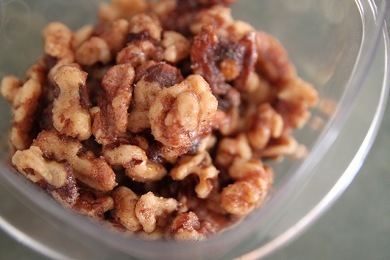 Enjoy the Walnut Recipe and the company of those you share it with!